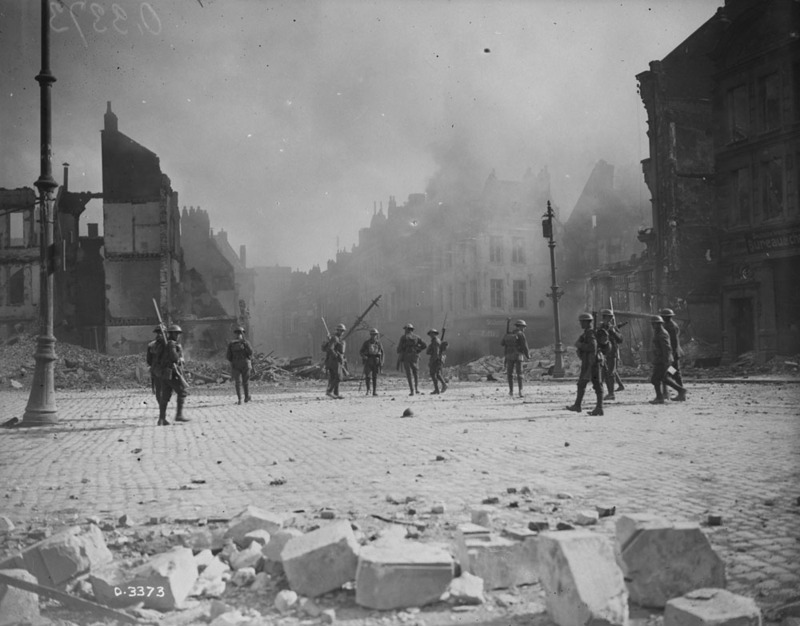 To the weary troops, the very name Cambrai was special: the largest French city awaiting liberation, and visions of its grandeur flowed. Early on the morning of October 9th 1918 the first Canadian troops tentatively entered the city. The battle to control it had ended a week earlier, but Allied generals were understandably wary of entering into fierce street-to-street fighting. A bombardment was strictly prohibited. As dawn approached and small patrols crossed the Canal de l’Escaut which ringed the city, and edged into the town centre, the sound of explosions could be heard. The air was thick with smoke. The explanation soon came: German troops had fled and left in their wake a looted, burning and demolished city. By noon the city was occupied without a shot fired. Canadian soldiers soon met English patrols entering from the south. With the capture of Cambrai and successes elsewhere, the German armies fell back across the entire front. The only question was: would the retreat continue, or would they turn and make a stand as they had so often before?